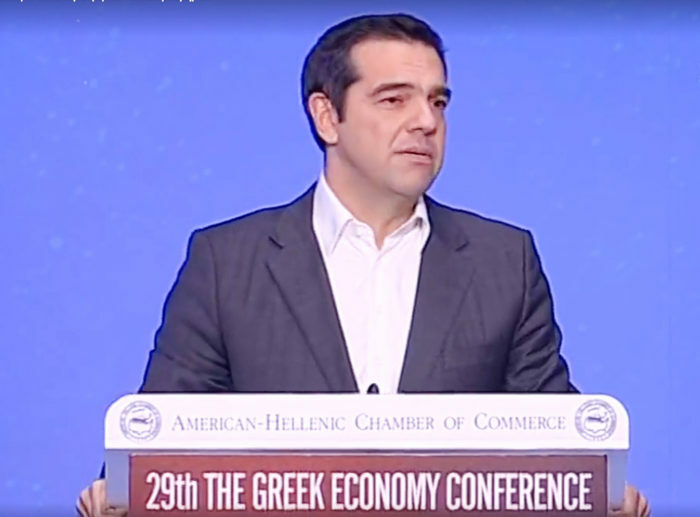 The Greek economy is growing at a rate of more than 2 percent and the rate continues to accelerate, Prime Minister Alexis Tsipras told the American-Hellenic Chamber of Commerce in an address. In his remarks to the Greek-American leaders in Athens on Tuesday evening, he added that “Greece is now a new economy, and this is not an exaggeration”. Tsipras mentioned the newly-established independence of the tax service, the overhaul of the insurance system, and the introduction of electronic transactions as important improvements to the overall financial state of the country. The premier also noted vast improvements to the licensing process as well as the transparency in public procurements and contracts and the creation of an investment-friendly environment in Greece. He added that the restoration of legality and rights in the labor market was another important aspect of the modernization of the Greek economy. The premier said that his government has made a great effort to reverse the sweeping repercussions of the recession, which had led a great part of the Greek population to a state of near-poverty. Tsipras mentioned the establishment of free nursery schools and school meals as important steps which assisted families during the recession. He also said new tax relief measures undertaken in the past few years were very helpful economically. He also stated that the establishment of a healthcare system that is now open to all was another vital part of the social safety net. The American-Hellenic Chamber of Commerce is one of the largest and most active American chambers in Europe. It was established in 1932 to promote economic and business relations between the United States and Greece.